Indacoin is a mobile-based, multi-coin crypto wallet owned by UK-based company Indacoin Limited, which also runs the Indacoin Cryptocurrency Exchange, launched in 2013. 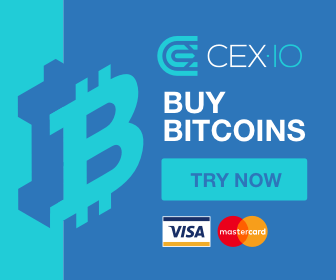 The wallet allows users to instantly buy Bitcoin and other popular cryptocurrencies like Ethereum, Litecoin, Bitcoin Cash, by using their credit/debit card. Moreover, users can also exchange their digital assets from within the wallet without needing to move their funds out. Since Indacoin mobile wallet supports more than 100 altcoins, users can easily manage their multiple assets using a single app. Users located in Russia or Turkey can withdraw BTC, or any other crypto, to a credit/debit bank card. For users located in other countries, only cryptocurrency-based withdrawals are available. If you are looking for fiat-based withdrawal methods, then it is highly recommended to check out our complete guide of the Coinbase exchange. 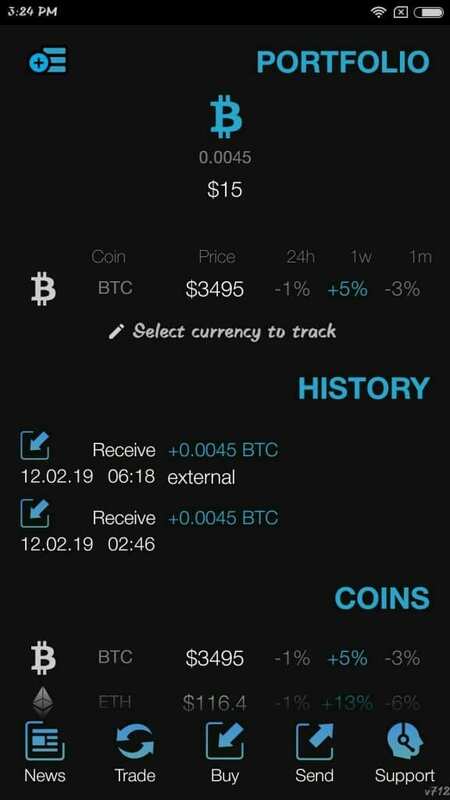 The user interface of the Indacoin Mobile Wallet is so simple that a novice trader can easily create a wallet account to buy, receive or send cryptocurrencies on the go. Apart from the US, Indacoin mobile wallet is available on more than 100 countries worldwide. Indacoin mobile wallet is available for both iOS and Android platforms. For Android, the minimum required version is at least Android 4.1. For iOS, the required version is iOS 9.0 or later. To download the Android version, visit this site here. The iOS app is compatible with iPhone, iPod Touch and iPad. To create a Wallet on Indacoin, it is enough to provide your mobile number as it doesn’t require any other personal information like name, email, or any other documents to verify your identity. First, download and install the Indacoin mobile wallet (iOS/Android) on your smartphone using the direct link provided in the above section. Alternatively, you can search the app by entering the keyword “indacoin” on Google Play or iOS App Store. Launch the Indacoin app on your phone. Here, you will see the registration screen. If your country is not selected by default, then select your country from the drop-down box. Then enter your mobile number and tap on ‘Next’. Within a few minutes, you should receive a 4-digit verification code via SMS. (In case you didn’t receive the code, you can request to resend that by tapping Resend or wait for an automated call to receive the code). Once you enter the verification code, you will be prompted to create a 4-digit PIN for your wallet. Choose a strong PIN and re-enter the same for verification. (Avoid using your birth/anniversary dates on the PIN. Keep this code as random as possible, to ensure better security). Congratulations! 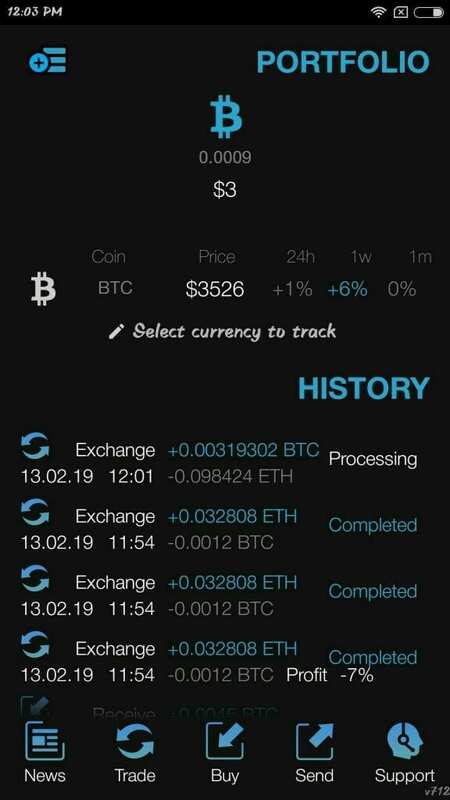 You have successfully created your account on Indacoin mobile wallet. Follow the below steps to receive BTC from another wallet. Open the Indacoin app and enter your PIN to login to your wallet. Tap the Three Horizontal lines icon located on the top left and copy the BTC address to the clipboard. Alternatively, you can also scan the QR code to get the address. Share the BTC address with the sender via email or message. In case you are transferring BTC from your own wallet, paste the BTC address on the recipient field. 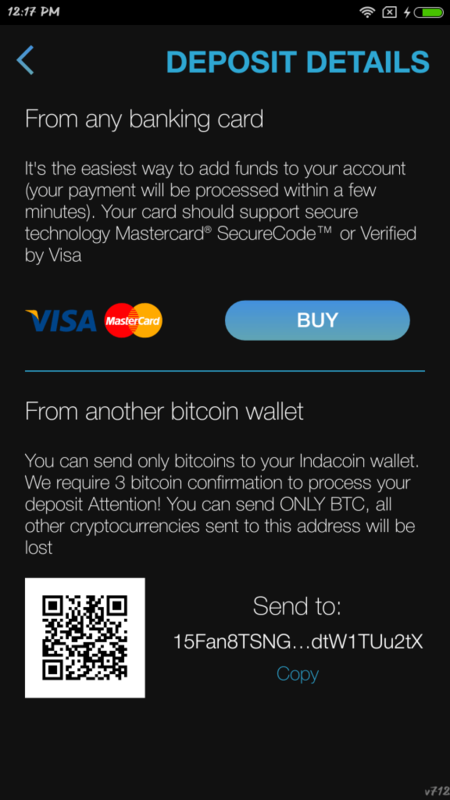 Once the transaction gets completed, you will receive the BTC on your Indacoin Wallet. 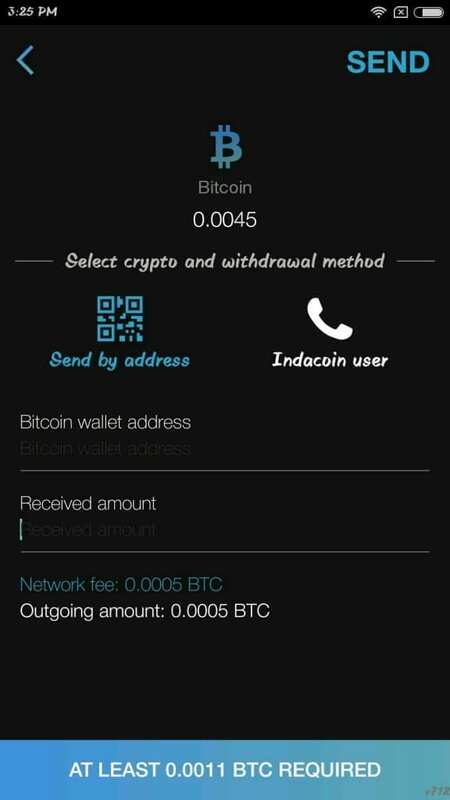 From Indacoin wallet, users can send the cryptos to another crypto wallet or Indacoin user. The network fee varies depending on cryptocurrency and the trading volume on the blockchain. For example, to transfer BTC to another wallet, the network fee is 0.0005 BTC. However, there are no network or service fees to send cryptos between two Indacoin wallets. 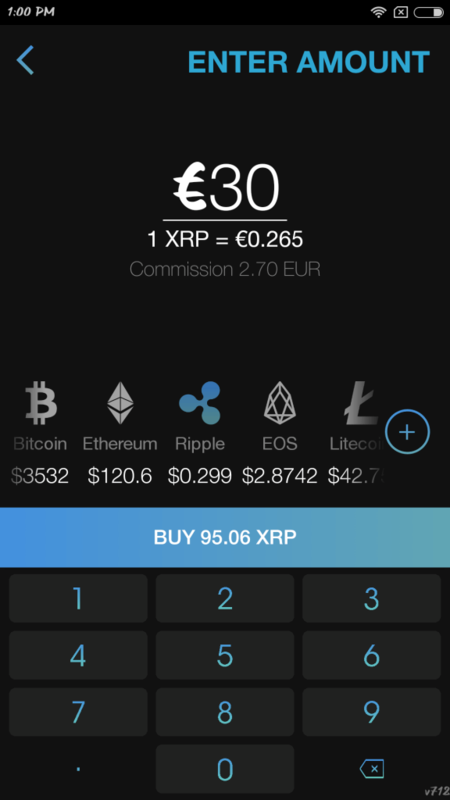 Tap Send icon after logging to your wallet and select the crypto you would like to send. Next, tap Send by address, if not selected already. Enter the wallet address and the amount you would like to send. You should make sure that the amount is greater than, or equal to the minimum amount which will be displayed on the screen. For example, you must have at least 0.0011 BTC in order to send Bitcoin to someone. Follow Step 1 in the above section. Next, tap Indacoin user, enter the mobile number of the user and the amount of transfer. Congratulations! 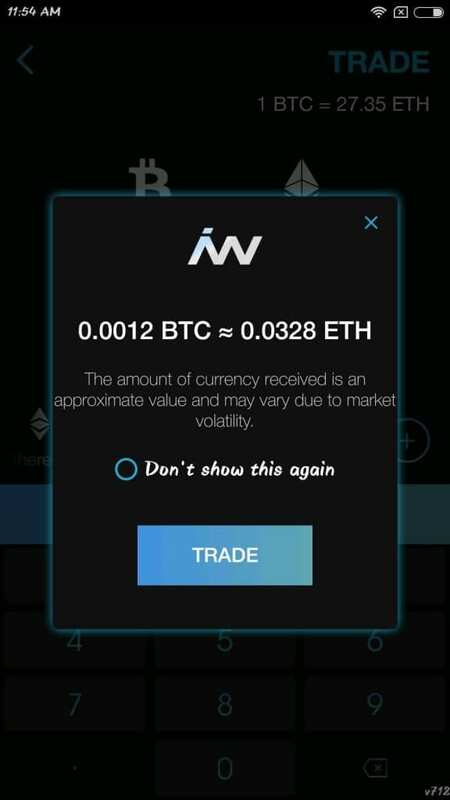 You have successfully transferred the cryptos from Indacoin Mobile Wallet to another crypto wallet. Indacoin Mobile wallet allows users to quickly exchange digital assets on the go. It is assumed that the user would have already deposited crypto like BTC on the wallet. 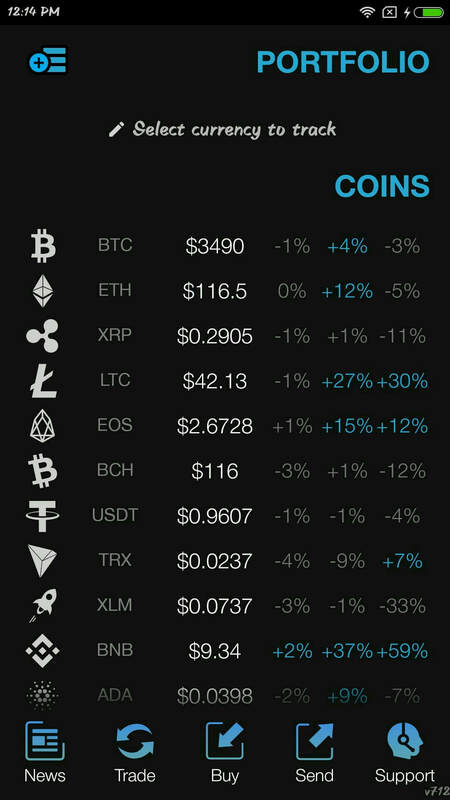 To start trading, you should have the minimum amount of cryptocurrency on your wallet which varies based on the coin. 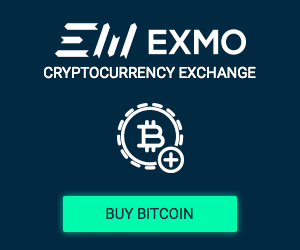 For example, the minimum trading amount for Bitcoin is 0.0011 BTC. Login to your wallet and tap Trade icon located on the bottom of the screen. Under the title ‘YOU GET’, select the coin and enter the amount you would like to exchange. Then, select the coin you would like to receive (i.e.‘YOU GET’). It will display the current exchange rate for the coins and the amount you will get. If the rates are ok, then click the ‘TRADE’ button. (Don’t forget to double check the rates and assets selected in this step, as it doesn’t ask for any kind of confirmation). Now, you will be redirected to the main screen and the status of your transaction will be shown as “Processing“. Once the transaction is completed, the status will change to ‘Completed‘ and the coins will be credited to your wallet. Indacoin mobile wallet allows users to buy cryptocurrencies using any VISA or Master Card without the need to visit any cryptocurrency exchanges. After logging in to your account, tap Buy icon located on the bottom of the screen. 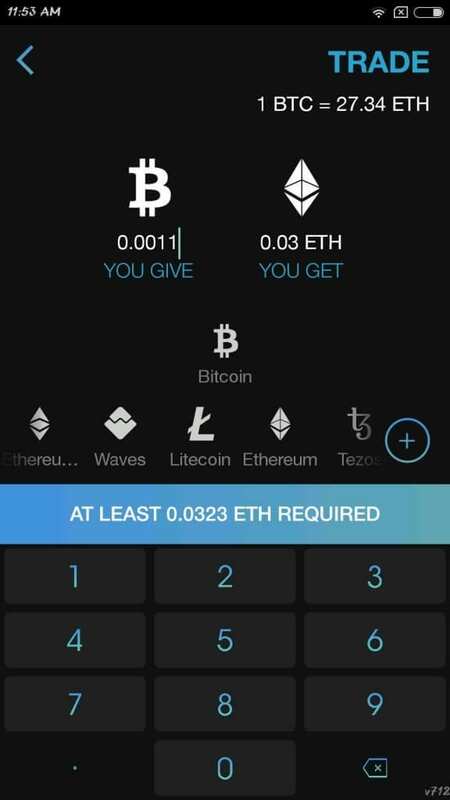 Enter the amount you would like to spend and select the cryptocurrency you would like to buy. (By default, the fiat currency shown is EUR. If needed, you can change that to other currencies like GBP, USD, RUB and AUD). Then, provide the details of your card (i.e. card number, expiry date, CVV) and tap the Pay button. If you are using any 2-factor authentication for your bank card, you must provide that code to authorize the transaction. Congratulations! You have successfully purchased your cryptocurrency using your bank card. Once the transaction is completed, the coins will be credited to your wallet. Note: All the above steps listed under the section “Setup & Configuration” are given for the Android version of the app. Even though the same steps will be applicable for the iOS version, there might be some minor variations in the menu navigation. 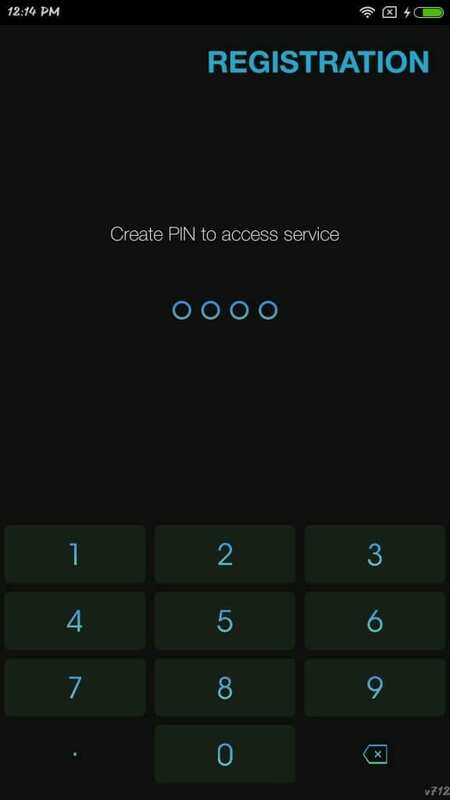 Except for the 4-digit PIN, Indacoin mobile wallet doesn’t offer any additional security measures to protect the customer’s digital assets. Even though there is an auto-lock timeout for the app, the time interval cannot be configured by the user. Additionally, it doesn’t ask the user to re-enter the PIN or send a TOTP (Time-Based One-Time Password), while performing a trade or transferring funds to another wallet. Users should always double check and make sure that everything is correct before tapping the Trade or Send button. There is no information available on the official website on where the private keys are stored on the device or on their servers. Even though mobile wallets are ideal for keeping small amounts of cryptos, it is highly recommended to use hardware wallets like Trezor or Ledger to store a large number of cryptocurrencies. In case your phone is lost, stolen or you have forgotten the PIN, you can recover the wallet by deleting the app and reinstalling it again. Next, you should enter the same phone number used when you created the wallet to receive the new PIN. Once you enter the new PIN, your wallet will be restored. Since your wallet is connected only to your phone number and not the device itself, it is possible to recover the wallet, even if you switch OS (Operating System). If you are unable to recover your wallet, then you can contact support by sending an email to support@indacoin.com. Otherwise, you can tap the ‘Support‘ icon located on the bottom screen of the app to get in touch with one of the customer support representatives. When it comes to problems with Indacoin Mobile Wallet, the only issue investors encounter is when they choose the withdrawal option. 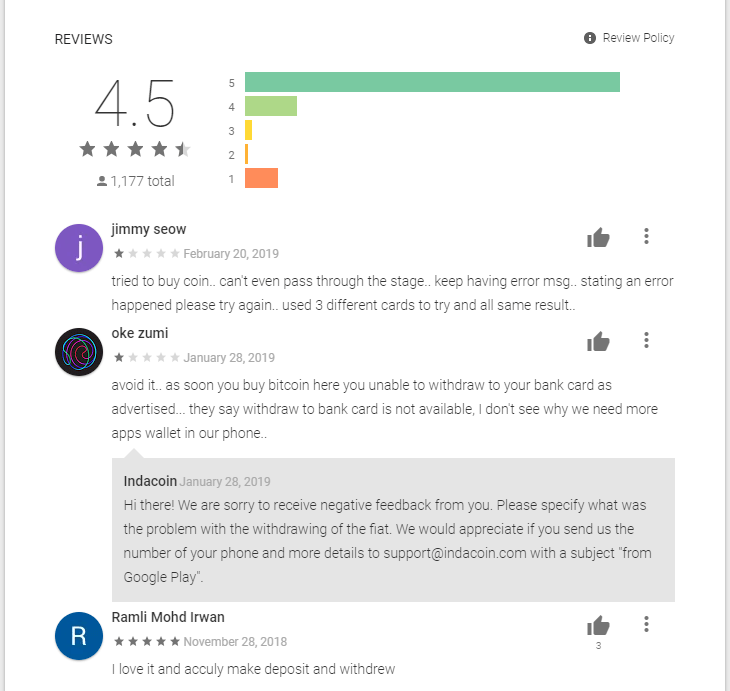 Even though the apps descriptions on Google Play Store and iOS AppStore claim that it is possible to withdraw funds using any bank card, that option is not available for the majority of the users. When it comes to customer support, most of crypto wallets don’t offer live chat or have a dedicated email address to resolve any customer-related issues. Even in the instance where a wallet does offer said service, it may take 1-2 days to get a reply even to simple queries. Fortunately, Indacoin wallet offers a 24/7 chat support within the app itself. For general queries or issues specific to transactions, you can enter your query on the chat window. Most likely, you will get a reply within 5-10 minutes. Both these wallets are mobile-based multi-coin wallets which allow the users to manage a diversified portfolio from a single app. Indacoin ties the wallet account to the user’s mobile number, whereas Coinbase doesn’t require an email address or a mobile number to create the wallet. When it comes to security, Coinbase wallet is safer as it offers additional security features like Touch ID and Recovery Phase to protect the customer’s funds. Both Indacoin and Coinbase allows the users to recover their wallets, in case the device is broken, stolen or lost. Even though both wallets have a user-friendly interface, Indacoin has made the GUI so accessible that an inexperienced investor can effortlessly purchase BTC, ETH or other cryptos instantly using their credit or debit card. Both Indacoin and Coinomi allow users to buy, send and receive cryptos on the go. Without a phone number, it’s not possible to create a wallet on Indacoin, whereas Coinomi doesn’t expect users to provide their phone number or email address to store coins. Coinomi wallet supports many cryptocurrencies in comparison to Indacoin. As for the recovery options, Indacoin sends a new PIN to the registered phone number to recover the wallet, whereas Coinomi allows users to recover the wallet using the 18 or 24-word recovery phrase. According to a Redditor, Coinomi has a major security flaw where Coinomi sends your recovery seed in plain text to Google spellchecker API. Being an HD (Hierarchical Deterministic) wallet, Coinomi offers better privacy for its customers’ funds, however, considering the security flaw exposed by the Redditor, we would highly recommend novice traders using Indacoin, while serious traders should opt for a hardware wallet.